Olympus’ Geoprobe 7822DT direct push drill rig is an extremely cost-effective tool for completing various types of site investigations. Projects range in size from delineating small roadside releases to conducting large scale investigations at major industrial facilities. 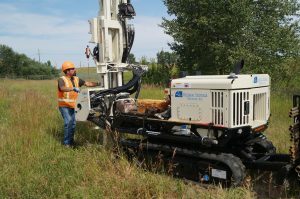 Using direct push technology we can collect soil, water, and soil vapor samples from a single sample location, allowing for a cost efficient and comprehensive delineation and characterization of subsurface environmental conditions. 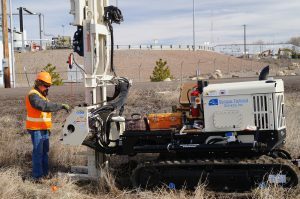 The Geoprobe is also compatible with many subsurface imaging systems, including laser induced fluorescence (LIF), UV induced fluorescence, and fuel fluorescence detection, further adding to the site investigation tool set. degree of professionalism, keeping updated on the latest training and technology, and providing a quality and cost-effective service while keeping safety as our number one priority. We think you’ll agree that our crew is our greatest asset. Our MC-5 and MC-7 single tube sampling systems maintain a high degree of sample integrity. We minimize the potential for cross-contamination by using disposable PVC sample liners at each interval, which can be set from two to five feet. The PVC sleeves also eliminate delays in drilling that could result from differences in the rate at which sampling and drilling can be accomplished. The discrete nature of direct push sampling and the configuration of the Geoprobe minimizes the impact to ground cover at the sample location. This reduces the impact of site investigations and minimizes the need for surface cover restoration. Direct push drilling also reduces the amount of cuttings, water, and other investigation derived waste (IDW) generated during investigations compared to auger and other drilling systems. The reduction contaminated material requiring handling and disposal not only reduces cost, but has proven to be enormously beneficial when working on sites with a small amount of operating and stockpiling space or where minimizing impacts is paramount. 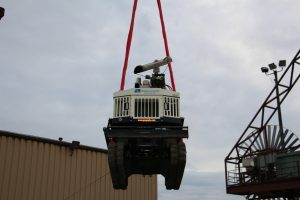 Our track-mounted probe has proven to be very capable in rough terrain, allowing us to drill in conditions that would prevent larger rigs from completing work for weeks or even months while waiting for conditions to improve. Using heavy lifting equipment, we have been able to place the Geoprobe into areas not accessible to larger machines. Through the advancement of borings and the installation of monitoring wells in these hard to reach areas, we’ve been able to close data gaps and characterize sites more effectively. 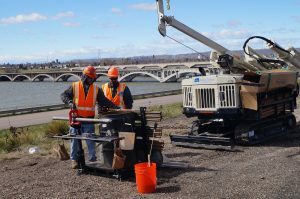 We offer affordable, high-quality drilling across the Northern Rocky Mountain and Northern Plains regions.. You can view our full list of environmental consulting services by visiting our website. If you have any additional questions or concerns, feel free to contact our friendly team of professionals today. We look forward to speaking with you!